Dundee United blew their chance of finishing 2016 on top of the Ladbrokes Championship as they lost 1-0 at Dumbarton. 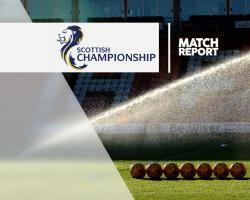 While the Terrors were in action they had been replaced at the summit by Hibernian after their win at Falkirk and Mark Docherty's 27th-minute goal gave them an even steeper uphill task to wrestle back leadership of the division. Mark Durnan hit the crossbar and a post for Dundee United but that is the nearest they came to an equalising goal and they ended the year with a first defeat in 13 league matches. Sam Stanton threatened early on for the hosts who then went ahead through Docherty's strike from the left side of the penalty area. Durnan hit the crossbar from close range at the start of the second half before Paul Dixon put two efforts over the top either side of the hour mark. Durnam came within a whisker of an equaliser again in stoppage time but his header hit a post.